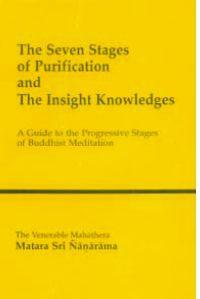 The Seven Stages of Purification and The Insight Knowledges is a guide to the progressive states of Buddhist meditation by Matara Sri Nanarama. The seven stages of purification provide the framework for the practising disciple’s gradual progress from the cultivation of virtue up to the attainment of the final goal. Integral to the higher stages of purification are the nine types of insight-knowledge, by which the disciple breaks through the delusions covering his mental vision and penetrates through the the real nature of phenomena. In the present book the stages of purification and the insight-knowledges are treated not only with the author’s great erudition, but with the clarifying light of actual meditative experience.